Every city has their landmark attraction where revellers celebrate the end of the old year and the start of the new one. 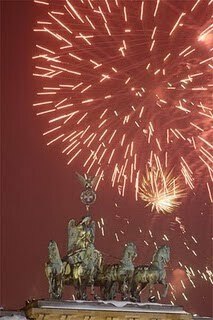 New York has Times Square, London has the fireworks from the London eye and Berlin, well Berlin’s main New Year extravaganza takes place in front of the Iconic Brandenburg Gate.Thanks to the new LGBT micro-site from the German National Tourist Office, it’s never been easier to find out about the country, and plan a trip to Germany. There’s something very symbolic about this as a venue for discarding the old and ushering in the new. This was of course one of the main gateways between East and West, Checkpoint Charlie in fact, one of the most potent symbols of the entire Cold War. Of course crossing here wasn’t quite as easy as nowadays and many people died, or were killed just for trying. It’s been 25 years since the wall came down, a fact that was celebrated in Berlin with a yearlong celebration of events, exhibitions and of course parties. So you could say that this is the climax of those celebrations, certainly something that I think is worth participating in. So with that in mind I surfed along to the Lufthansa site and booked a return trip to the German capital. I love Berlin at any time of the year to be honest but December is one of my favourite times to visit. Although Christmas has passed the city is still decorated to the nines and there’s a really festive atmosphere as the New Year looms. It’s crisply cold too, not that damp kind of cold that you get in London at this time of the year. It’s properly frosty even with the sun shining brightly it doesn’t have the strength to raise the temperature much above freezing. I’ve arrived on New Year’s Eve itself which gives me just enough time to check into the Axel hotel for a quick relax before getting ready for the evening. The official celebrations in and around the Brandenburg gate start at 6.30 and I plan to make the most of the evening so head off for the start of the action. There are several areas where there is free entertainment for an expected crowd of 1 million people who come to see the new year in here every year. The main stage is in front of the gates itself on Pariser Platz and it’s a very impressive site to behold. There’s already a large crowd assembled and the party is well and truly underway with a band blasting out tunes to an enthusiastic crowd and a very impressive light display from the top of the gates themselves. It’s down the Straße des 17. Juni between Brandenburger Tor and Siegessäule that I head for though. This two kilometer long road through the Tiergarten has an overall space of 80,000 square meters which is full of show stages, video screens, party tents, food and refreshment stands and light and laser performances. There’s all manner of entertainment to watch, the party tents give respite from the cold and make the perfect place to join the jubilant party atmosphere. It doesn’t take me long to start talking like a native, well I can manage Happy New Year in German “Guten Rutsch” which is a start at least. The party rolls on gathering momentum until the countdown to the New Year begins and the place to be apparently is outside. It’s not hard to see why once the crowd collective roars “Drei, Zwei, Eins!” and the fireworks start. It’s certainly an impressive pyrotechnic display that reaches several breathtaking climaxes before the final roaring crescendo. The end of the fireworks seems to only signify the start of the real partying and the street seems to pump with an even greater energy. It’s quite clear that the party is going to go on until well into the small hours and it’s difficult to resist joining in. Eventually it’s time for bed and the warm hotel room that awaits.